How Do You Make A Fiat 124 Abarth Even Cooler? 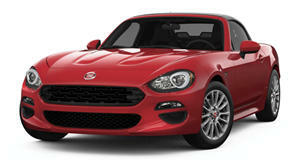 While Fiat's 124 Spider is a Mazda MX-5 clone, the Abarth version is a little better, and the rally version better still. The recent addition of the gives the cousin the pedigree it seems to have been missing in the first place. The scorpion-badged tuning division of Fiat gave the 124 Spider better underpinnings in the form of some Abarth-tuned parts like Bilstein dampers with stiffened anti-roll bars which sees an improvement in the already good handling, while a Record Monza exhaust ups the power ever so slightly - 10 hp. That's about it, besides some new looks. The good news is there's a 124 Spider that's been tuned to run in the FIA R-GT Cup - with a 300 hp turbocharged 4-pot. The finished was recently filmed testing in Italy and it looks great, even sans race livery. It sounds the business and has all the usual rally car splutters and farts, but details are a little thin on what's going on under the hood. They claim it's a turbocharged 1.8-liter lump that's good for 300 hp, but we're yet to learn about the motor's origins, it could well be a stroked motor with mods or more likely, the Alfa Romeo 4C's 1.8-liter motor with a more aggressive tune that takes it up to 300 hp from the factory 237 hp. Either way, just listen to it! We must admit, it's quite reminiscent of a tuned .